Welcome to The Nautical Star! Adorable cottage with Slimline AC. Very short walk of 0.3 miles to Paines Creek Beach. Adorable cottage with Slimline AC in the bedroom! Very short walk of 0.3 miles to Paines Creek Beach. 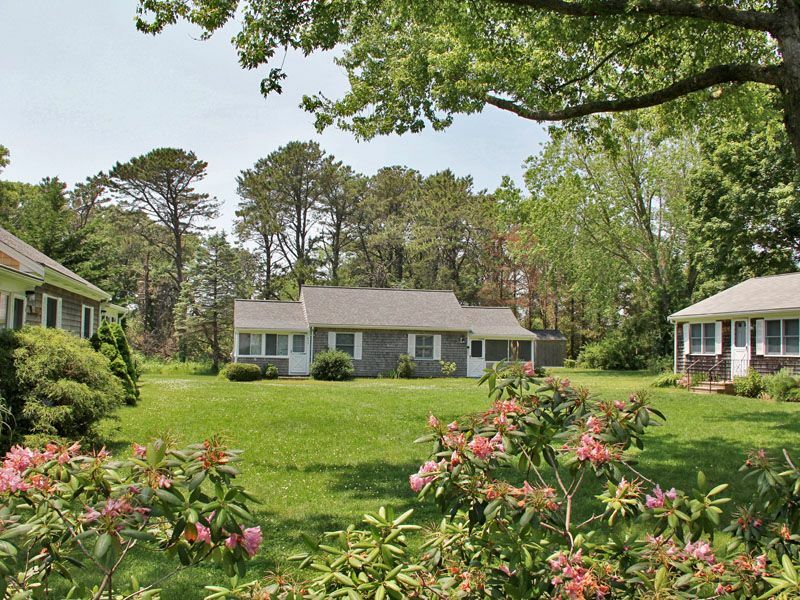 Enjoy this cozy, one bedroom duplex style cottage located in the Gull Colony Complex in Brewster. It sleeps 4 which is perfect for a couple or a small group. The home also offers free WiFi too. Enter through a screened-in porch that is set up for your relaxation. The cottage is well equipped with a Slim-Line AC unit in the bedroom. The open living room and kitchen area has a Queen sleep sofa, flat screen TV, and even a side table that opens to a full dining table. Off of the kitchen is a spacious deck with a dining set, furniture, gas grill, enclosed outdoor shower, and a nice yard. The galley kitchen is fully equipped with everything including a lobster pot (no dishwasher). The bathroom is totally updated with a beautiful vanity, shower, and interesting coastal tile work. The bedroom has a Queen bed and doors to the back deck too. There is even a full size washer/dryer here. Paines Creek Beach in Brewster is one of those Cape Cod gems that is a must visit on the Bay-side. It is most loved by families who want a quiet spot to relax and smaller kids who love to play in the tidal pools or search for fiddler and horseshoe crabs. Plan to be there at high tide, or you may have to walk a mile to get from the beach to the water's edge. Walk to Katie's Seafood, Lemon Tree Shops, Dunkin Donuts, and Luke Liquors. 2 Rolls toilet paper, Tissues, Hand Soap, Sponge, 2 Trash Bags, Dish Soap, Dish Washing Detergent, Hand Sanitizer, Paper Towel, Laundry Detergent (for guests with a 1 week min stay). No Smoking, No Pets Please! Max parking of cars at property: 1 No parking on lawn anytime. This home has Keyless Entry with a 3pm Check-In/10am Check-Out. Very nice and quiete place for the vacations. The place was absolutely beautiful. Nice renovated. Everything was just perfect. The location was excellent, quiet, clean and convenient to the beach and restaurants. We did not utilize the kitchen however it was well stocked. the bed was comfortable however it was difficult to get in due to its height. The only recommendation I would make is that the closets need to be uncluttered. I had to remove items and place them on the porch in order to hang clothing. They appeared to be filled with items other renters had left such as shampoo pillows blankets in other items. Whatever people bring they should remove on leaving or toss it if unclaimed. However our stay was remarkably nice. Glad we rented this location thank you. What a wonderful week at the cottage. It was super clean and adorable inside!! The kitchen was fully stocked. My only suggestions to the owner is for a little more storage.... The only closet in the bedroom was full of pillows and other supplies. I could not even put my suitcase in there. Also there is only one small bathroom mirror. I would of loved a full length mirror. The sunsets at Paines Creek beach make everything better!! I hope to come back next year! So glad you enjoyed your stay! We love the cottage too and the proximity to the beach. We are happy to share your feedback with the owner on the closet space and mirror. We hope to see you next summer! a quiet, new and confortable small house near the beach. We spent a nice week in this cottage. We absolutely loved our little cottage; such a short walk to the beach and it had everything we needed. It is nicely finished on the inside. We will be back! This cottage was perfect for my husband, myself and our 13yr old daughter. We loved how new and updated everything was. The cottage was also well stocked with just about anything you would need. The only very small detail that could be addressed is the bed while pretty comfortable is very tall, a step stool kept in the already very well supplied cleaning closet could remedy this easily. The outdoor shower, large private deck, and comfortable outdoor furniture were terrific! We enjoyed many mornings and evenings relaxing on the deck watching the birds and bunnies. Loved the very short walk to the beach with gorgeous sunsets and endless space to walk in the shallow water at low tide. Overall our family enjoyed our stay immensely!